Print Page - Viking Supporters Co-operative - And representing DRFC, its Kirk Sandall Juniors! 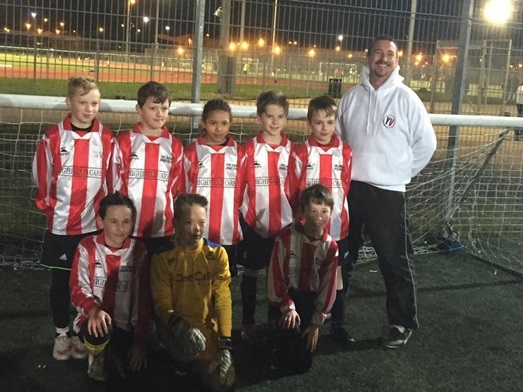 And representing DRFC, its Kirk Sandall Juniors! The Football League's national competition, the KINDER SPORT+ KID'S CUP 2015, gets into the Area stage in a few weeks and the Viking Supporters Co-operative are delighted to announce that the Rovers' representatives are Kirk Sandall Juniors. Under the guidance of teacher, coach, former Keepmoat "Matchday Man on the Mic" and VSC Board Member Alan Roberts, the lads will be sporting the VSC-sponsored hoops the club's own Academy sides wear, thanks to the club's generous decision to loan them the kit to ensure they look and feel the part. The Area Finals take place on March 12th at the Development Academy of Crewe Alexandra FC. Alan and the boys have been working exceptionally hard alongside Ben Mawson (Doncaster Rovers Academy), Tom Chambers (DRFC Academy Coach) and Josh Rowley (Eden Grove FC) in recent weeks to ensure they are ready to represent the club at the 6-a-side tournament next month. In the run up to the tournament, the boys will be playing warm-up competitions with DRFC's U-10s and U-11s development squads, having a couple of DRFC coaches attend their training sessions and will be playing on the Keepmoat pitch at half-time when the Rovers take to field for their rescheduled home fixture against Bristol City next Tuesday. We'd like to wish the boys the very best of luck and will bring you updates of their progress. If they succeed at Crewe they may just get to represent the Club again later in the season at Wembley Stadium prior to the Johnstone's Paint Trophy final.